Perhaps the greatest benefit of having an organized RSS feed is efficiency. Granting that you have organized the right search keywords listed in your feeds, you are guaranteed access with the freshest and hottest topics right away without having to manually search the web. 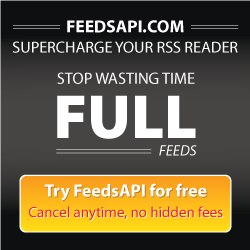 In this post, you will look at a full text RSS feed as your own personal content delivery vehicle. Subscribing to blogs that are trending will give you new things to talk about. The RSS will give you an early exposure to topics that are currently in, giving you ample time to search for more key information that others have not yet covered on that area, providing you the chance to be the first in publishing them. Question and answer feeds are also an excellent strategy in discovering particular topic areas that you can write about. This keeps your audience constantly updated and informed, giving them the impression that you are also keen in presenting immediate answers to their questions. One way to maximize communication with your audience is by having a snippet to your post, and adding a link for reference. Once you set up your reader with your preferred topics, you can backtrack and collect all of the contents of each feed that was already archived for a year or more. This will serve you well when you would want to find and update any popular topics in the past, and possibly gain back the attention of your past audiences. One key feature of an RSS is gathering huge lists of data, depending on the topic that you would want to pull together. By using the search function, you can find posts of a particular subject, and the RSS will do the job in compiling a list of related posts right away. Web surfers and content writers that are using a full text RSS feed often finds satisfaction with its straight and uncluttered approach in categorizing information. There’s almost no end to its ability in helping you gain visibility with every updated content in the web. You will see the power of a full text RSS feed as a distribution tool of information for everyone, perfect for keeping the quality of your content consistently at its best.